By Alan Green in Uncategorized, VectorVest on 29th November 2018 . AIM listed iEnergizer Ltd, (IBPO.L) is a global provider of Business Process Outsourcing (BPO). Leading companies in the Healthcare, BFSI, Gaming, Publishing and Legal industries successfully outsource mission-critical business processes to the Company. With over 12,000 staff, IBPO builds and operates customized customer contact, back office and high-volume transaction processing centres serving the entire customer lifecycle, from outbound first contact to post-sales support and everything in-between. The VectorVest stock analysis and portfolio management platform flagged up the IBPO investment opportunity to members in August 2018. Although the stock has literally doubled in price since then, it still logs an excellent Relative Timing (RT) (stock price trend) rating of 1.48, (scale of 0.00 to 2.00) and a very good forecasted GRT (Earnings Growth Rate) of 16.00%. Less adventurous investors may be discouraged by the RS (Relative Safety) rating of 0.92, (again on a scale of 0.00 to 2.00), but trading at 120p, IBPO is still clearly undervalued against a current VectorVest valuation of 140.27p per share. The chart of IBPO is shown above using weekly candlesticks over the past 3 years. The share is trending upwards strongly and is on a BUY recommendation on VectorVest. Earnings per Share (EPS) has risen strongly over the past two months while EPS has increased by 3 times over the 3-year period shown. Summary: VectorVest members who bought into IBPO after the platform flagged up a clear valuation gap in August will have doubled the value of their holdings in the space of just a few months. 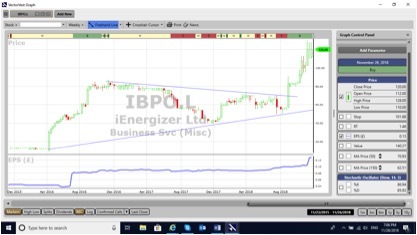 Normally a period of consolidation occurs after such a rise, but IBPO still appears to have legs, thanks to a stellar set of interim numbers, strong cash position and bullish view for the second half of the financial year. The low RS reading may serve to discourage some investors, but the results, outlook and charting position all point to further near term growth. Buy.